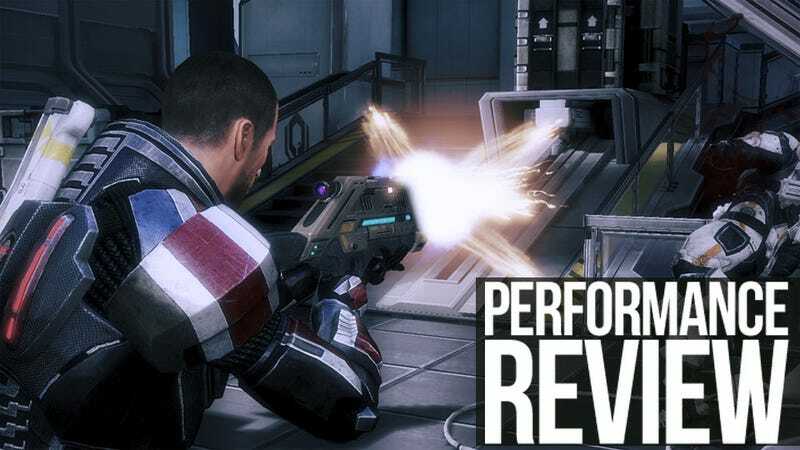 Which PC Hardware Best Contributes to Mass Effect 3's War Effort? Again, we'll have to take their word on all because we won't be examining those aspects of the game. However, what we will do is benchmark ME3 across three different resolutions with two dozen GPU configurations — including AMD's new Radeon HD 7000 series. We'll also see how the performance scales when overclocking an eight-core FX-8150, along with benching a handful of other Intel and AMD processors. With the visuals maxed, we were surprised to see the Radeon HD 5670 hit 38fps at 1680x1050. While we don't consider this ideal performance (which is traditionally 60fps), it suggests very low-end graphics cards should be able to play ME3 at lower resolutions — great news for budget gamers. To hit the desired 60fps, gamers need only look to the Radeon HD 6770 or the new HD 7750, while the GeForce GTX 550 Ti is even faster at 65fps. Beyond that, it doesn't really matter as older mid-range cards such as the HD 5830 are capable of 74fps, while the GTX 460 was much faster with 84fps. Bumping the resolution up to 1920x1200 requires at least an HD 5830 or HD 7770 for optimal 60fps+ performance, though you should be able to get by fine with an HD 6790 or GTX 550 Ti. Virtually any halfway competent mid-range card will do the trick, with the GTX 560 and HD 6870 exceeding 80fps.